Foreign Exchange market, commonly referred to as Forex or simply FX, is the largest financial market where currencies are bought, sold and exchanged one for another. Unlike, for example, stocks market, it has no centralized exchange and transactions are performed over-the-counter, that is, participants trade with one another through a worldwide network of banks, brokers and other financial institutions. As a global market Forex is open 24 hours a day, 5 days a week. 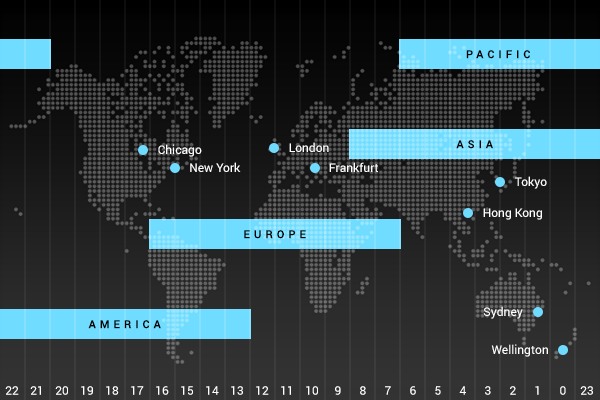 The major financial centers are based across almost every time zone – in London, New York, Tokyo, Zurich, Frankfurt, Hong Kong, Singapore, Paris and Sydney. Depending on the exchange active during a specific time, one can distinguish between three trading sessions: Asian, European and American. To learn more about trading sessions please follow the link. In foreign exchange currencies are quoted against one another in pairs and the price indicates how much of quote (second) currency is required to buy or sell one unit of base (first) currency. Exchange rates are driven by forces of supply and demand: currency value usually increases whenever demand for it is greater than supply and decreases if demand is less than supply. Moreover, prices fluctuate in response to economic, social and political events that occur throughout 24-hour trading day. Political situation and economic performance of the countries involved have a profound effect on the currency prices as well. For instance, a country with lower inflation rate will typically see increase of its currency value in relation to the currencies of its trading partners. Inflation is also highly correlated with central bank's interest rate: lower interest rate can depreciate exchange rate and vise versa. Another detrimental factor in price setting is orders from Forex market participants, that are quite diverse in volume they generate and influence they have. Governments and central banks such as the European Central Bank, the Bank of England, and the Federal Reserve of the US operate with the largest volumes and have the most influence on exchange rates. Central banks try to control inflation, money supply, interest rates and are in charge of supervising commercial banking systems. They can use foreign exchange reserves to intervene in the market to stabilize currency rates or achieve a specific economic goal. The second largest group comprises major banks and bank associations that form so called interbank market, through which they transact with each other and determine the currency price individual traders observe in the trading platform. Since forex is a decentralized market, you can often see that different banks offer slightly different exchange rates for the same currency. OctaFX clients receive the best bid/ask prices quoted from our vast liquidity pool. Another group of forex participants is brokerage firms that act as intermediaries between individual traders and the market. They use electronic communication networks (ECNs) to offset clients’ orders with its liquidity providers, which may comprise of various financial institutions. This execution model eliminates a conflict of interests between the brokerage and its client when an order is executed. An ECN brokerage, unlike a market maker, is compensated through commission that can either be charged per each order or included in the spread as a mark up. You can learn more about ECN execution here. 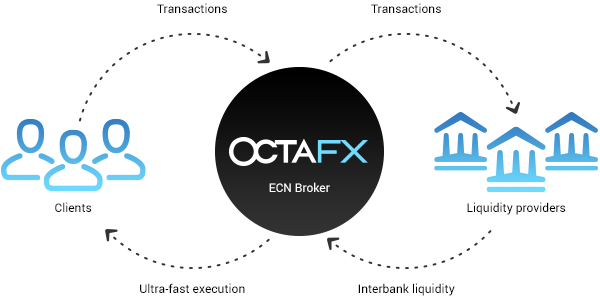 An ECN brokerage allows individual traders to access the forex market, which initially was the domain of large financial institutions only, and gain profit from price fluctuations. Even though daily price fluctuations are seemingly small, often less than 1%, use of leverage can increase the value of these movements. Traders interact with a broker through a trading platform - a piece of software that allows to buy and sell currencies. It can be installed on your desktop computer, mobile device or even accessed via web browser. It’s highly important to consult various ratings and review before investing. OctaFX acts in accordance with major international laws and regulations to provide most secure and reliable service to our clients. OctaFX execution model eliminates any conflict of interest between the client and the broker: we act as an intermediary between you and the real market by offsetting orders one by one with competing prices from our vast liquidity pool. You can be sure our execution speed is under 0.1 second and OctaFX clients do not experience any re-quotes. In general, spread can either be fixed or floating: the former remains the same even though the price is changing, while the latter varies depending on the market situation and is normally more tight than the fixed one. Spread should be taken into account as the lower it is, the less you pay for each trade. Our tight floating spread, along with no trading commission, ensures low cost of trading and accurately reflects what is available in the market. Every trader looks for versatility: wider range of trading tools allows to select pair you are comfortable trading, leaving a space for experimental trading as well. With our great selection of trading tools you can trade the market you are interested in. Full list is available here. More important for newbie traders, accessibility of trading is also determined by the amount of minimum deposit. At OctaFX you can start with as much as $5/€5 as your initial investment. It will help you try various techniques and applying different trading strategies and will help you to be prepared for serious trading. Good news is that maximum deposit is unlimited! Making sure your funds are safe is of primary importance while making investments. OctaFX uses 3d secure technology for Visa/Mastercard deposits, and SSL encryption to protect client’s Personal Area. All measures taken make financial information secure and inaccessible to any third parties. Negative balance protection feature protects traders from unexpected market circumstances: if the trader’s balance becomes negative, OctaFX compensates it back to zero. Thus, your losses cannot exceed your deposits. Negative balance protection feature comes handy in a constantly changing economic environment: OctaFX reversed our clients’ negative trading balances back to zero after Swiss franc event in 2015, while some of the brokers went bust. Choosing an account type suitable for your level of trading experience is vital to ensure you are using your trading potential right. Our range of trading accounts allows traders with different experience and needs to operate their funds accordingly: micro accounts allow new traders to practice with minimum deposit of $5, while live ECN account offers a wider range of trading tools for more experienced traders. You can compare account types here. As daily price fluctuations are seemingly small (often less than 1% of a cent), it is important to choose a broker which offers a substantial leverage. The higher your ratio is, the less funds you will need to hold a position. OctaFX offers flexible leverage system with the highest leverage ratio of 1:500. Selecting a trading environment you need to consider general platform’s usability, compatibility with your device and the amount of trading instruments available for technical analysis. OctaFX provides you with Metatrader 4 and cTrader platforms, both available in desktop, mobile and web-platform versions. Compare trading platforms here. If any questions regarding trading occur, Customer Support will provide a trader with relevant information on how to solve any problem he may have. Our award-winning Customer Support is available 24/5 and it takes around 5 minutes on average to untangle even the most complicated issue a client may have. Thanks to large daily trading volume, deep liquidity, availability 24/5 and low costs, Forex definitely stands out when compared to other markets. It allows a trader more flexibility when choosing how and what to trade, along with considerable leverage, tight spreads and small investment. You can learn more about Forex market advantages here.